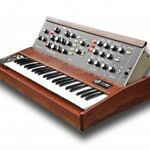 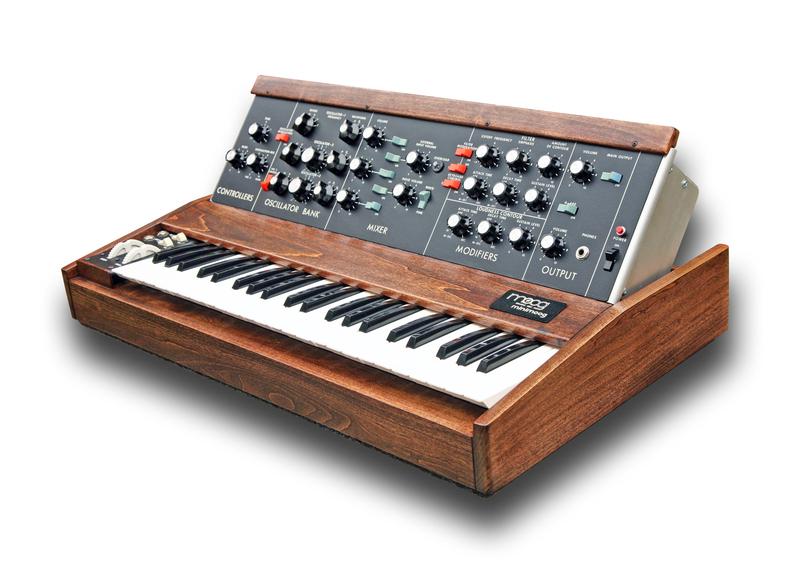 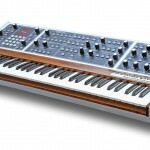 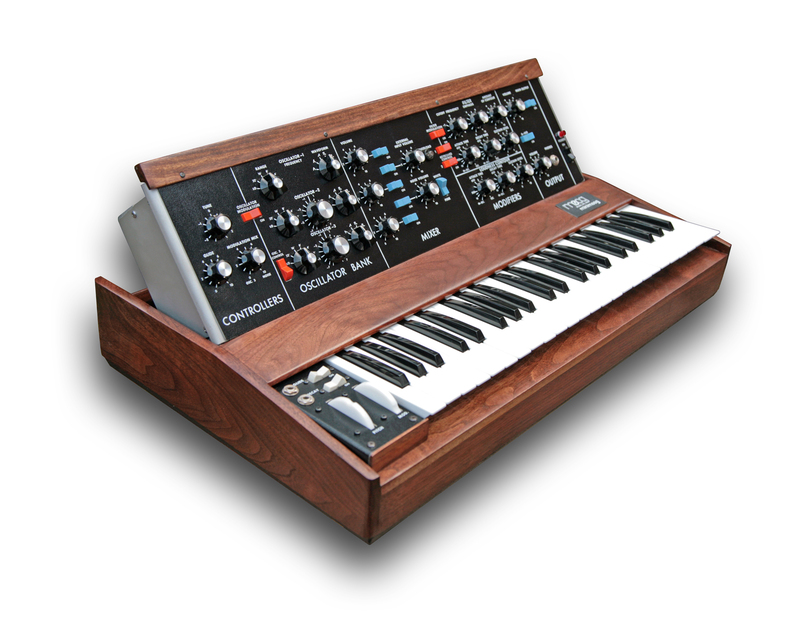 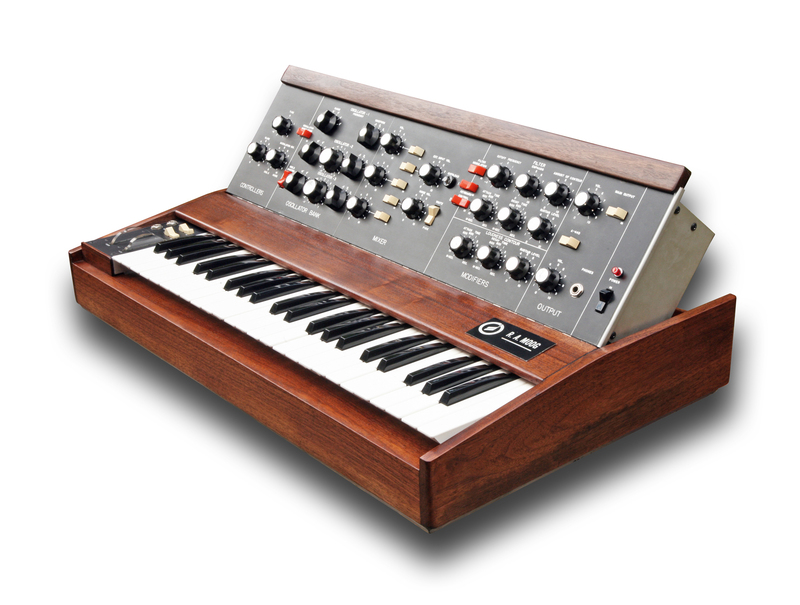 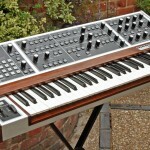 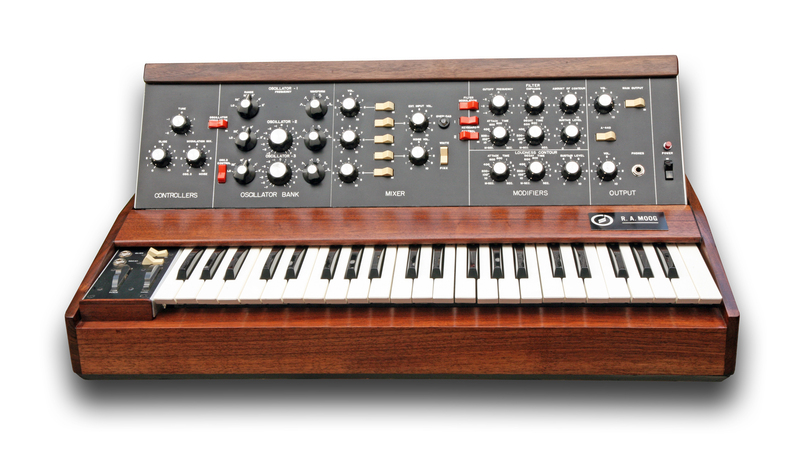 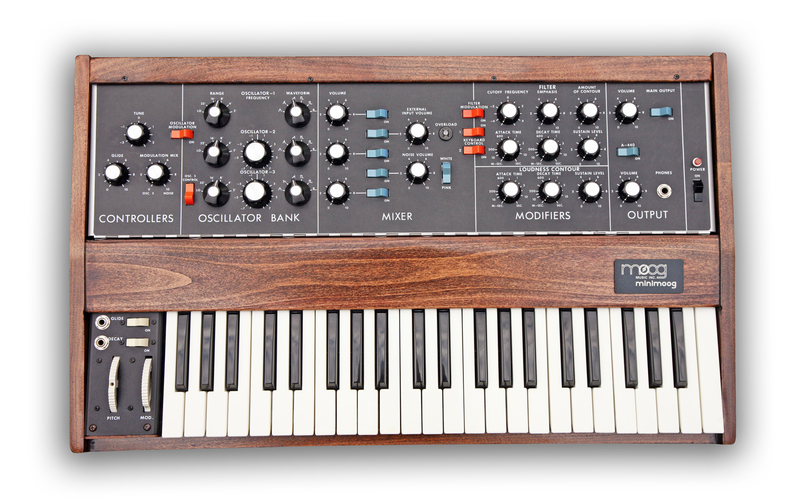 We are very pleased to be able to offer an early muSonics Minimoog (serial #1192) which are highly prized and rare models. 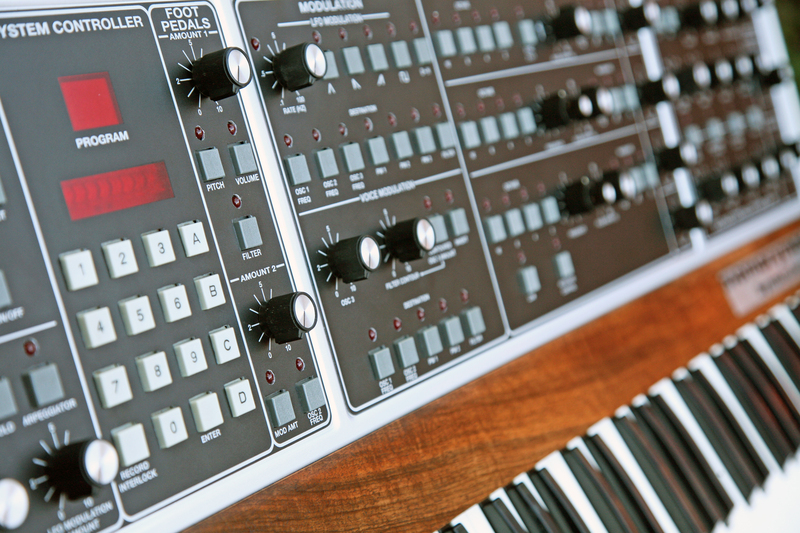 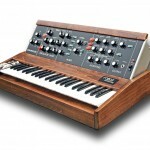 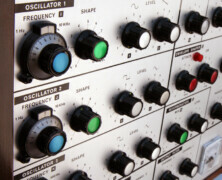 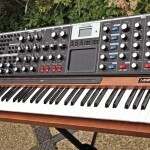 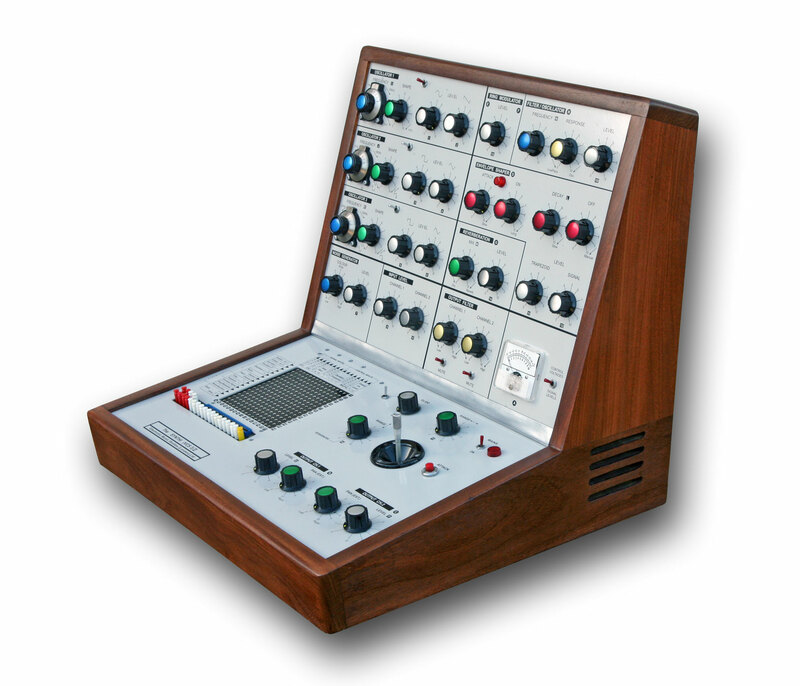 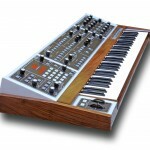 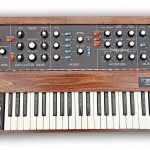 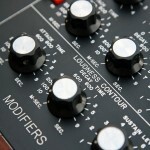 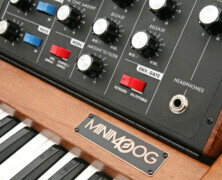 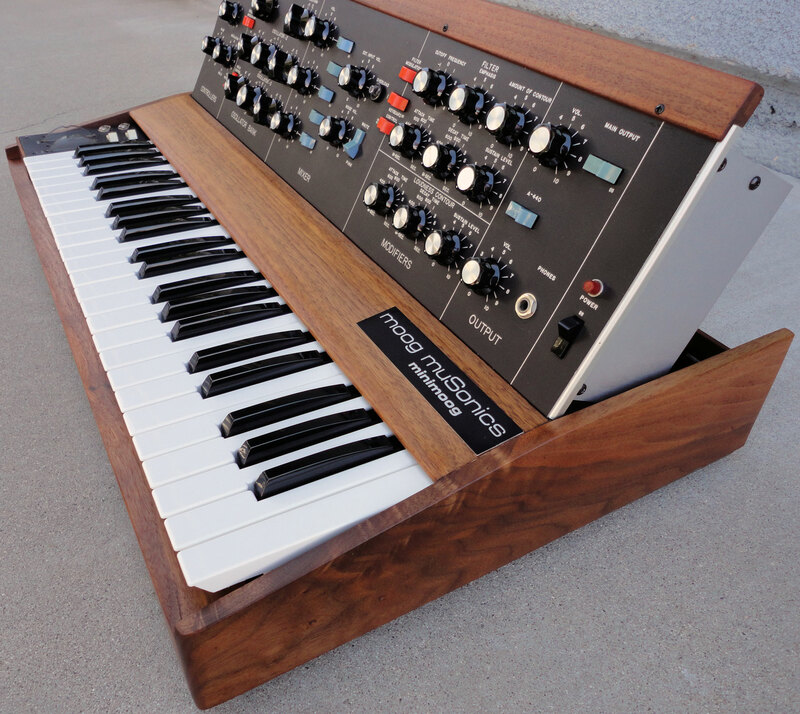 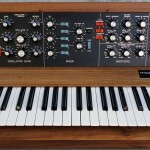 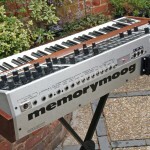 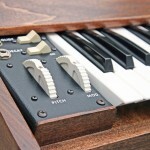 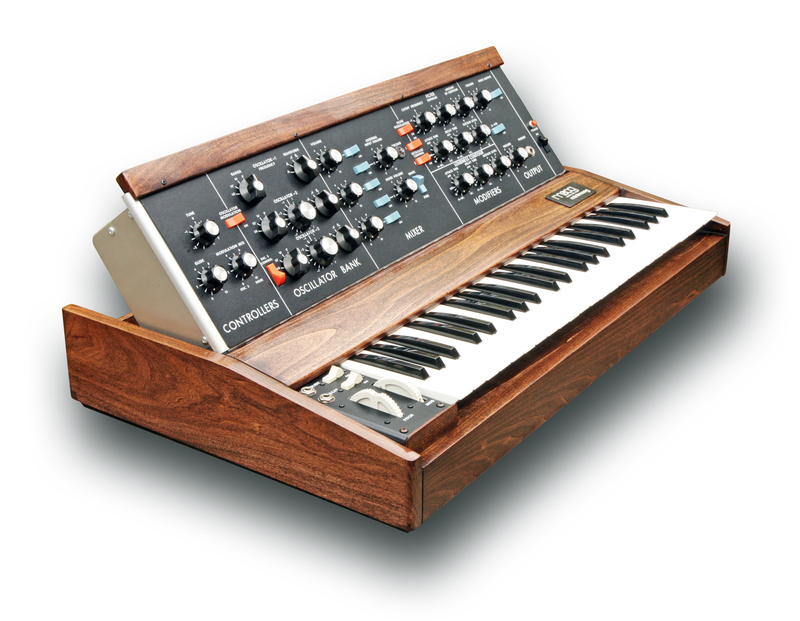 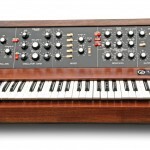 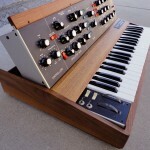 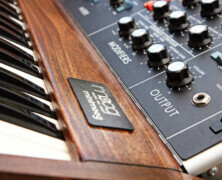 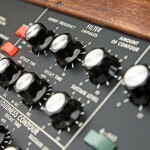 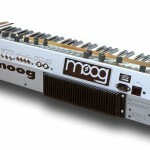 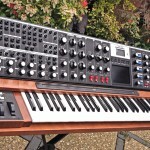 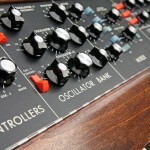 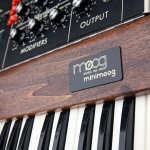 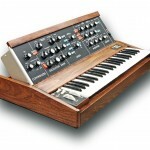 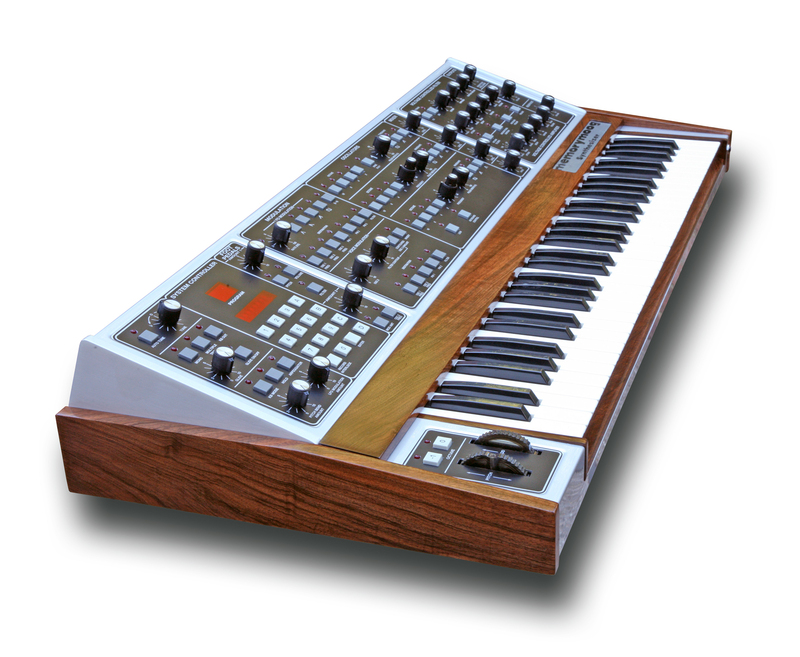 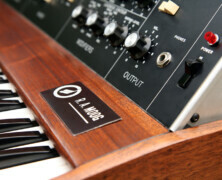 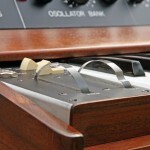 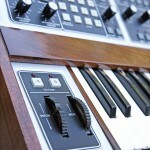 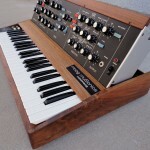 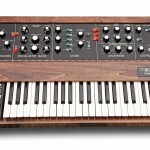 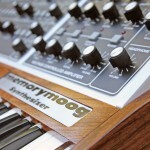 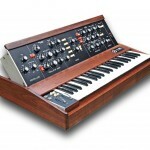 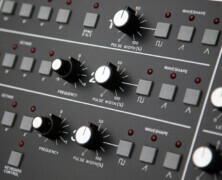 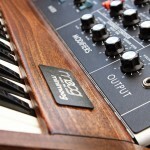 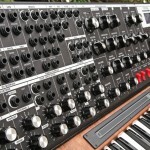 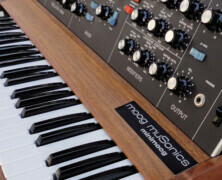 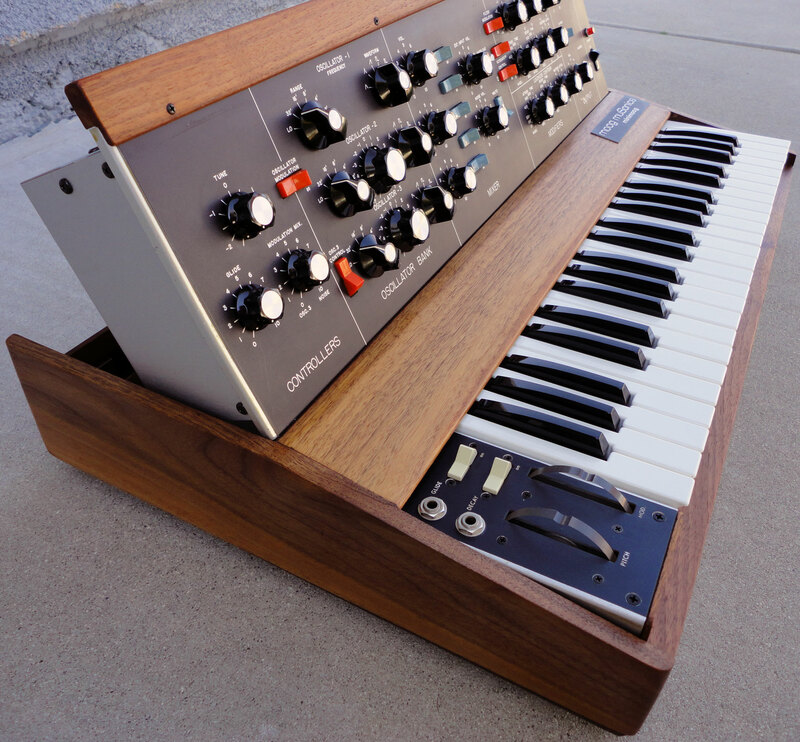 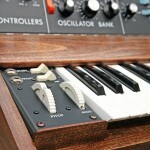 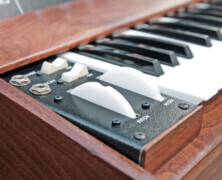 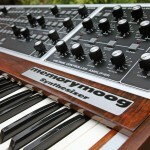 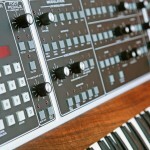 These early Minimoog versions differ from the mainstream production versions (post 1973) in that they exclusively used the much fabled ‘RA Moog’ circuitry, metal-etched control panels (with more detailed incremental graphics), Walnut cabinets, squared back panel, clear perspex pitch/mod wheels and no voltage selection like on the later models. 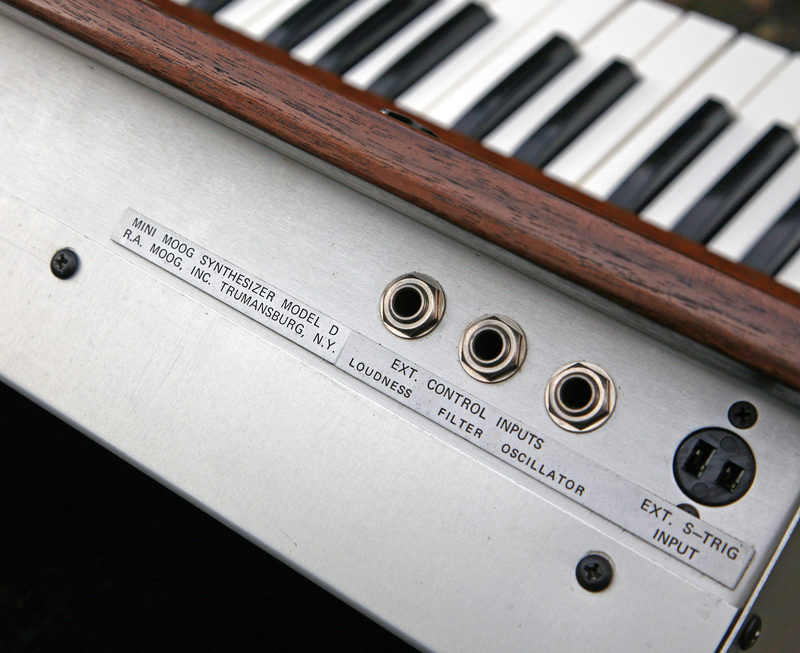 This one is especially rare in that it was made in Trumansburg, NY, rather than Williamsville like most of these. 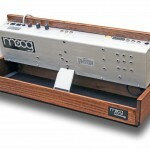 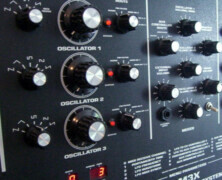 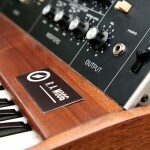 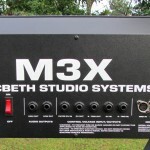 This is Likely because it’s an earlier muSonics and was made while RA Moog was transitioning to Moog muSonics. 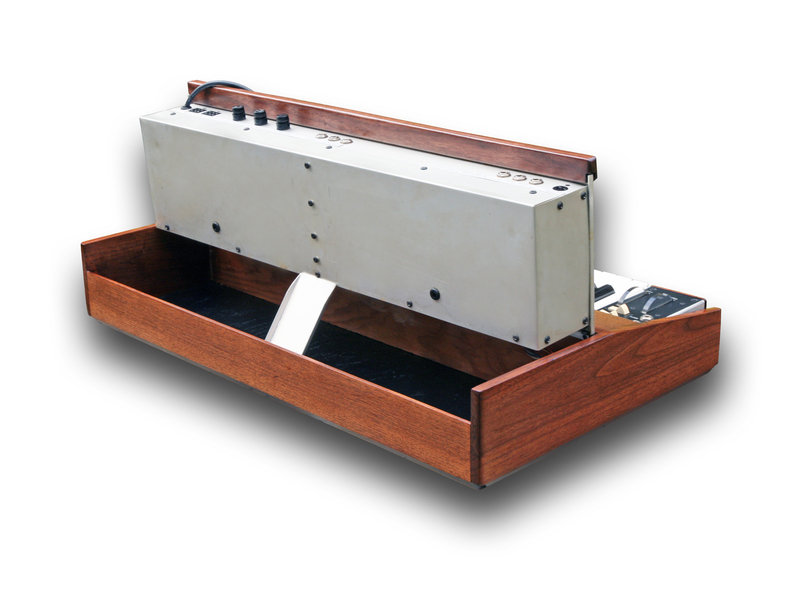 The original walnut cabinet and black bottom have been retained, which is really important on such an historic instrument. 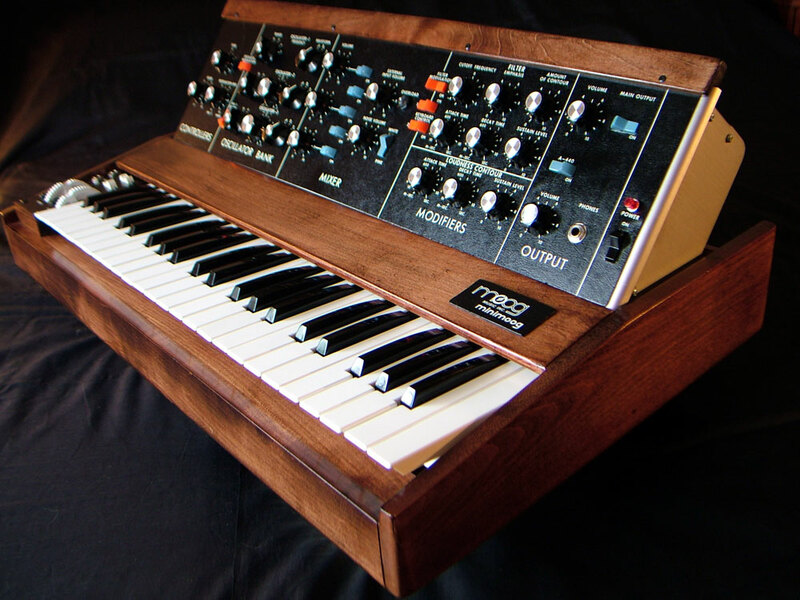 As such, the Walnut cabinet is over 42 years old, so shows a wonderful aged character, and the professional restoration work has been carried out sympathetically so the original patina remains intact – it’s in beautiful condition as you can see from the pictures below. 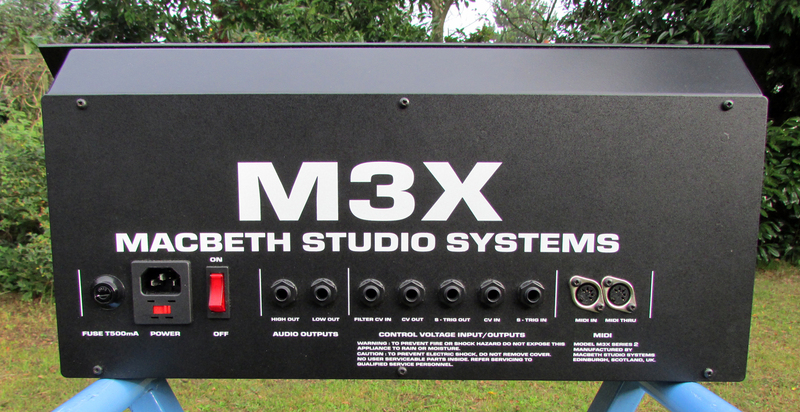 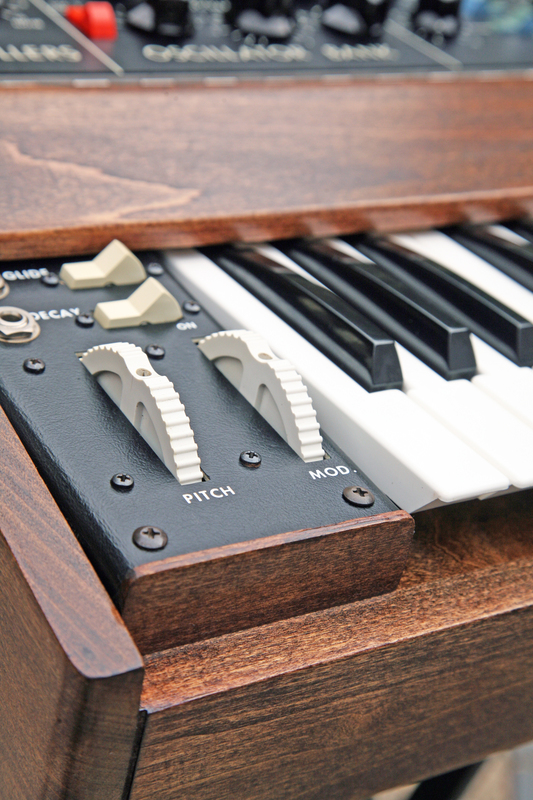 This muSonics has a new set of knobs (from the original company that supplied them early on), all new keys, a re-anodized back panel, new Switchcraft washers & nuts and all of the external black anodized screws have been replaced. 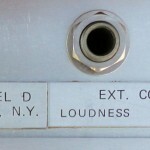 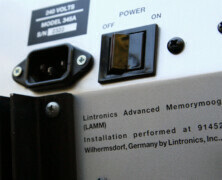 The original lamp style cord has been retained. 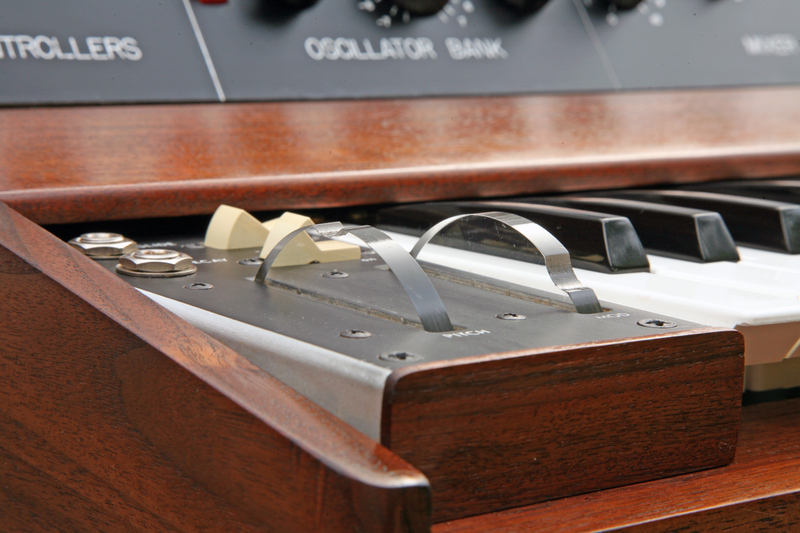 Part of the paper where the serial number is located is missing, but you can still see the number if you look carefully. 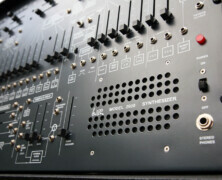 Remember, this was before the serial numbers were stamped on these units. 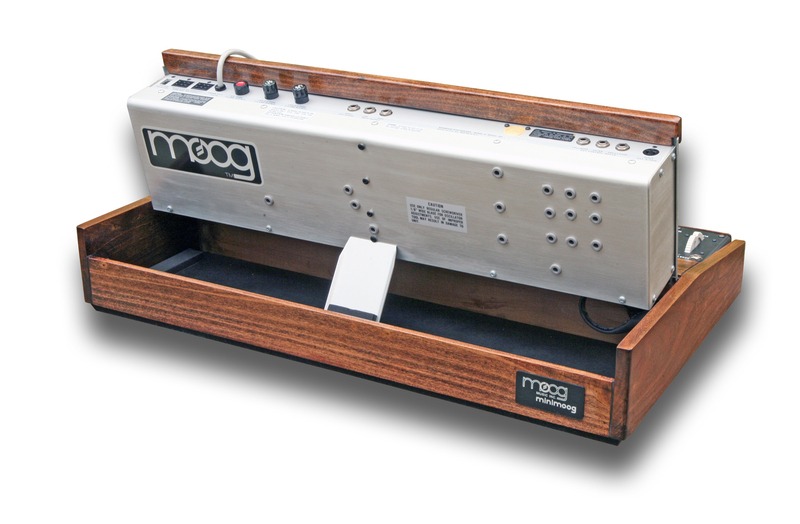 The Moog has been completely disassembled and cleaned, all electrolytic capacitors replaced (all boards/rectifier board, power supply), all switches cleaned, all potentiometers have been replaced (except glide and emphasis) with brand new ones, all trim pots replaced, all edge card connectors re-soldered, has a new set of matched precision octave resistors, had an original ‘Moog buffer board’ installed for better tuning (this was done internally so no holes were drilled on this rare piece), replaced heat-sink compound on all transistor pairs, all wiring replaced (very time consuming) with new harness ties (keyboard connectors, mod section, octave switches, external connectors & jacks), replaced noisy headphone amp driver and output transistors, re-soldered PCB solder connections, everything tightened, the keyboard has been completely rebuilt with new stand-offs, new keys, new key bushings, all pivot points on the keyboard re-lubed, the buss-bars burnished, keyboard leveled, and the synth has been fully calibrated. 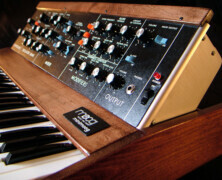 The cost of the restoration work has exceeded £2600 alone! 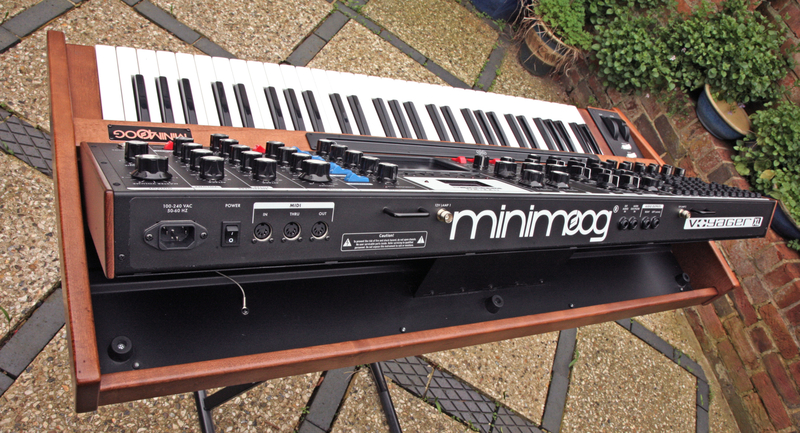 The MuSonics Mini is based in the USA (runs on 110V), so the cost of shipping, and any applicable import duties are not covered in the advertised sales price below. 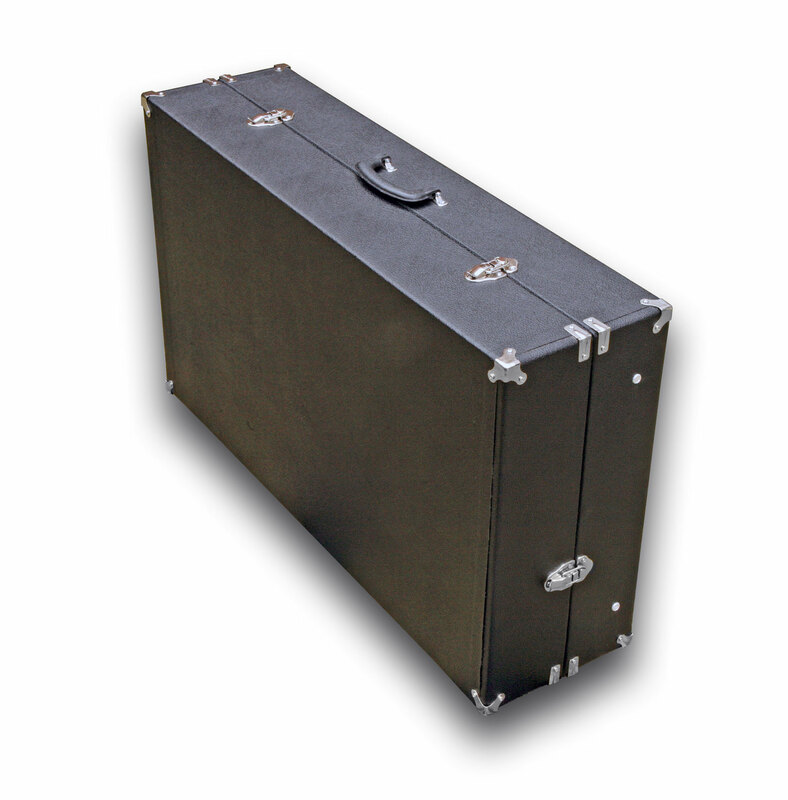 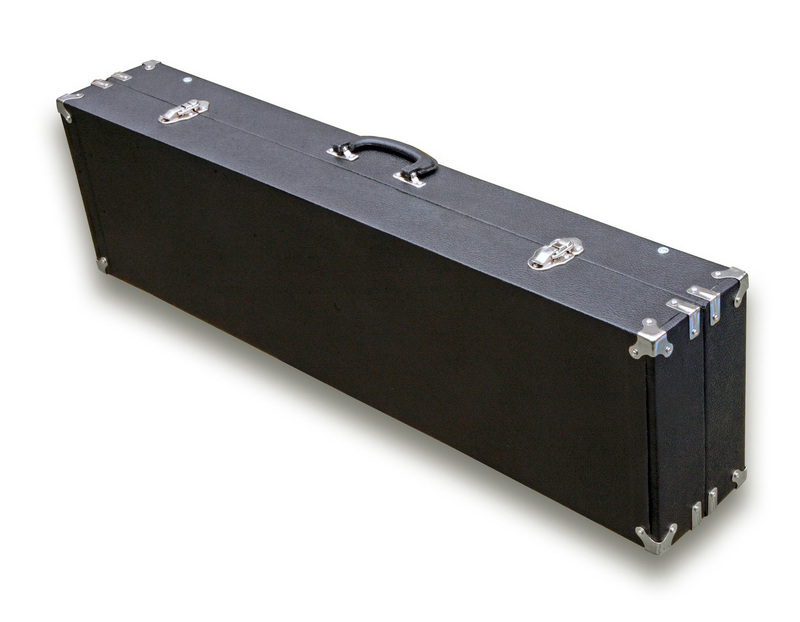 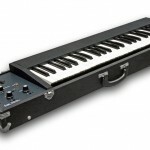 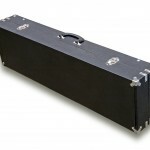 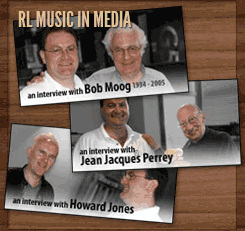 For a quote to ship it to you the please contact Richard at RL Music directly to discuss your requirements etc. 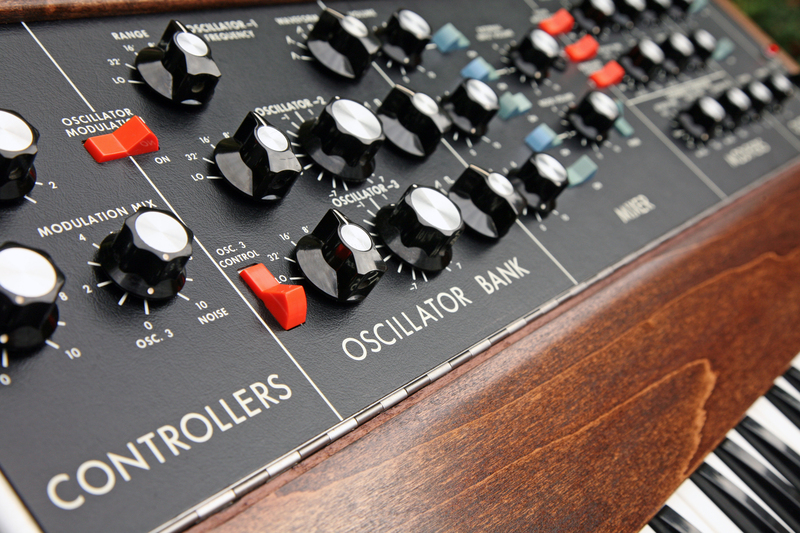 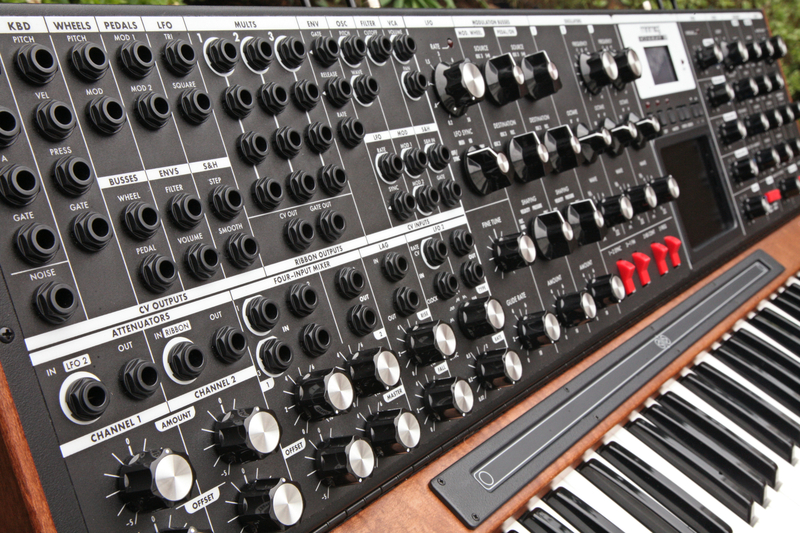 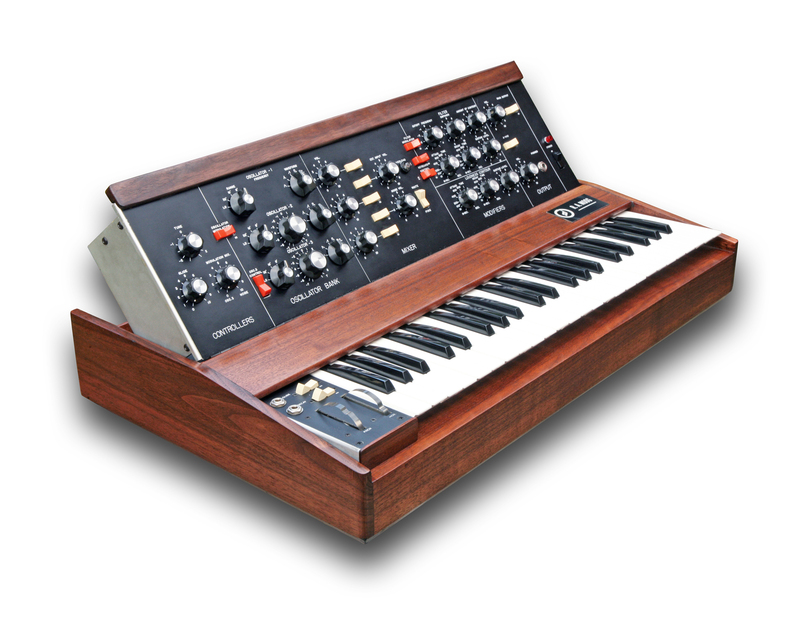 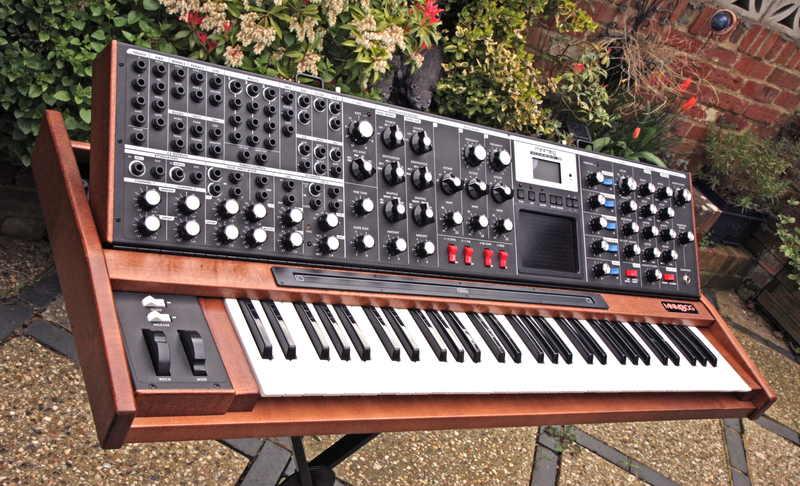 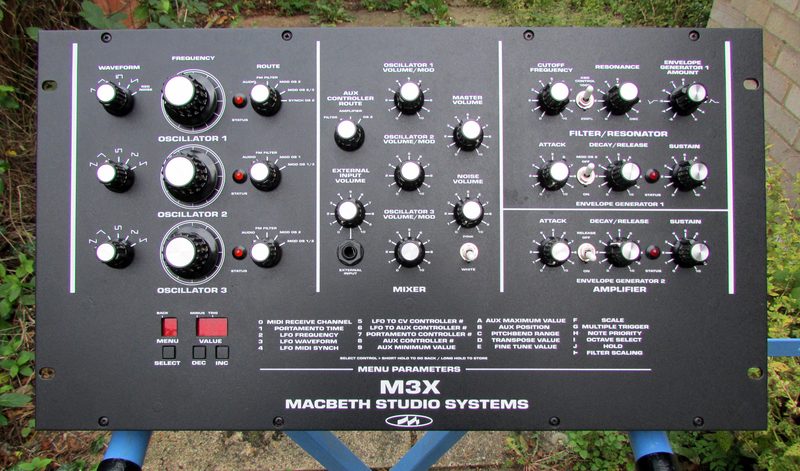 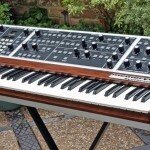 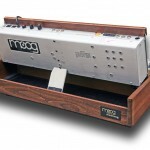 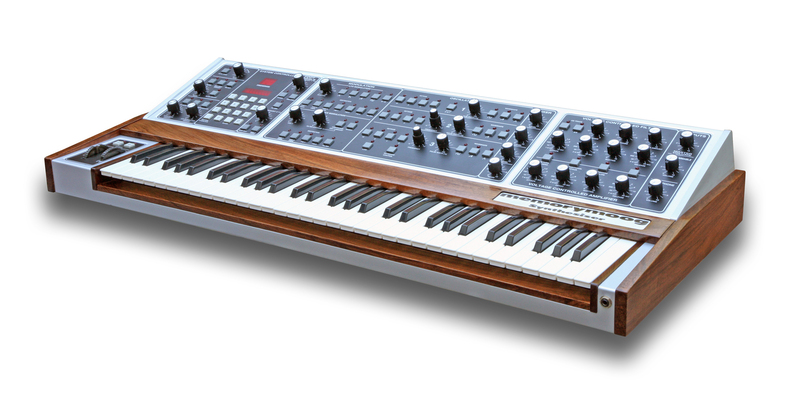 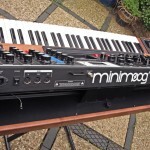 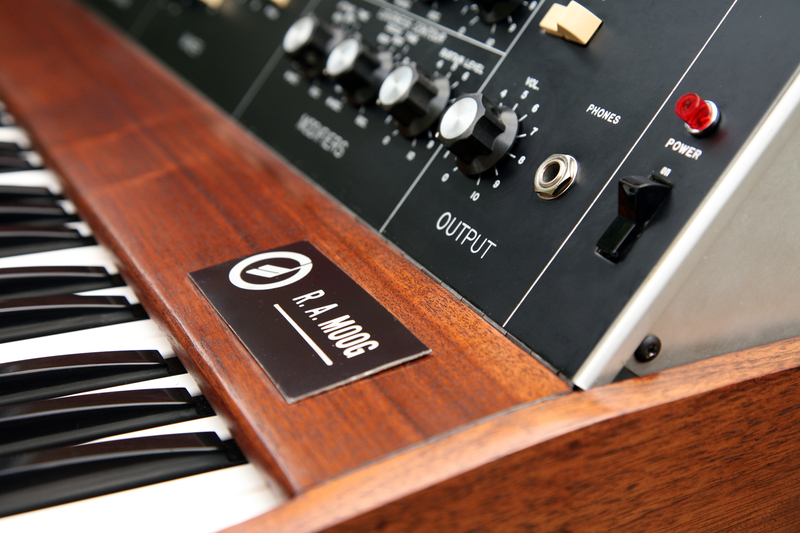 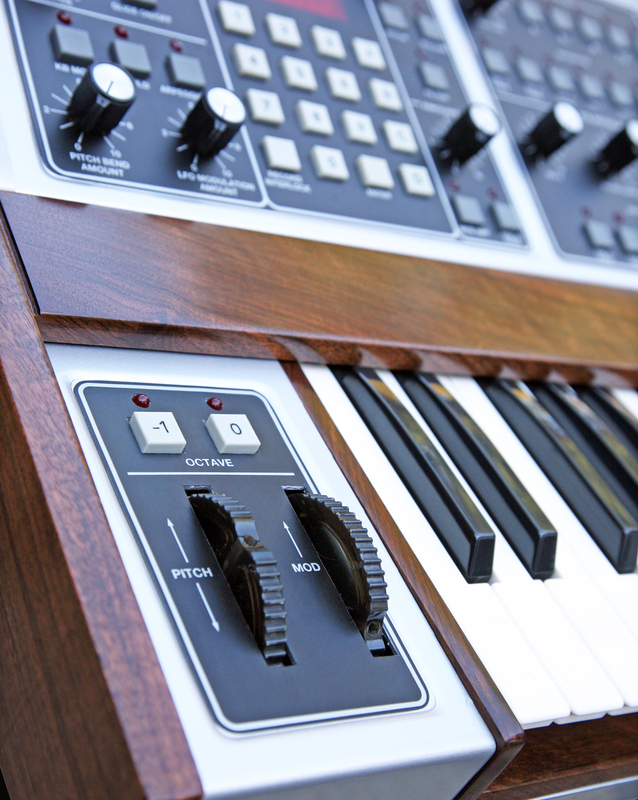 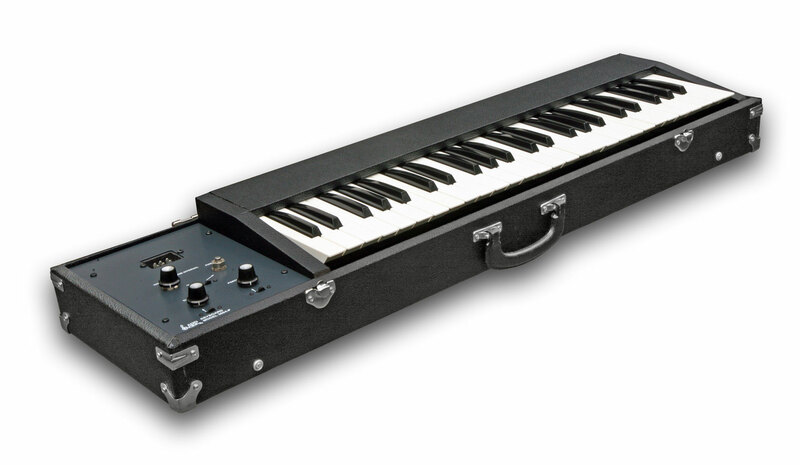 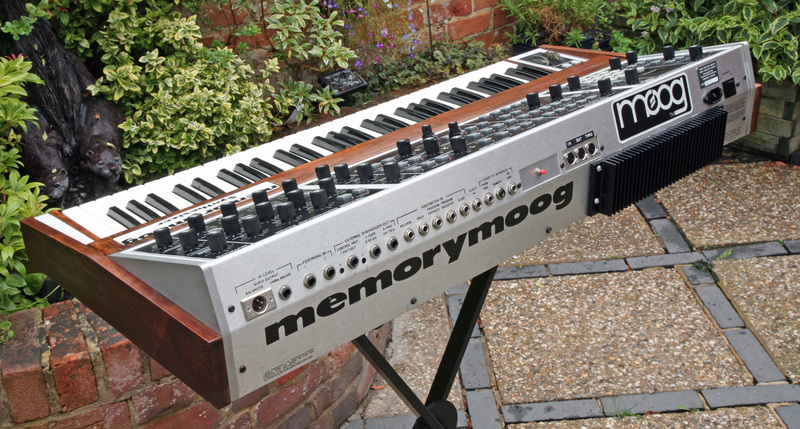 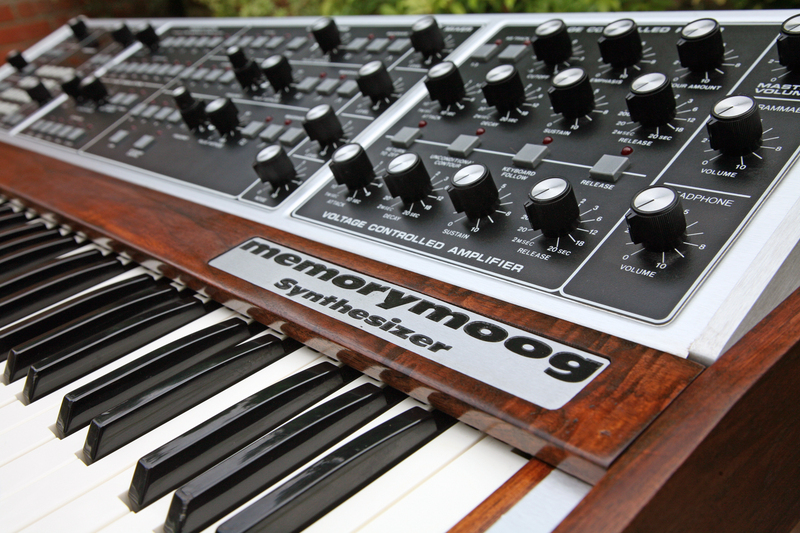 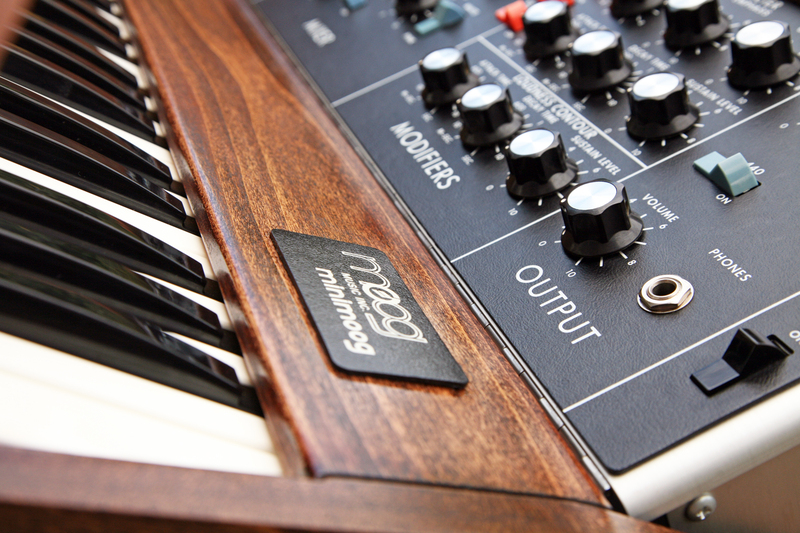 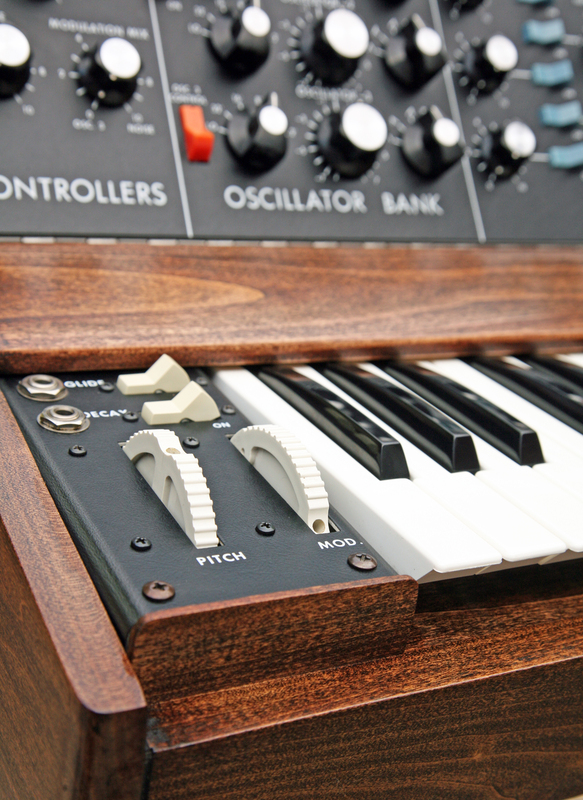 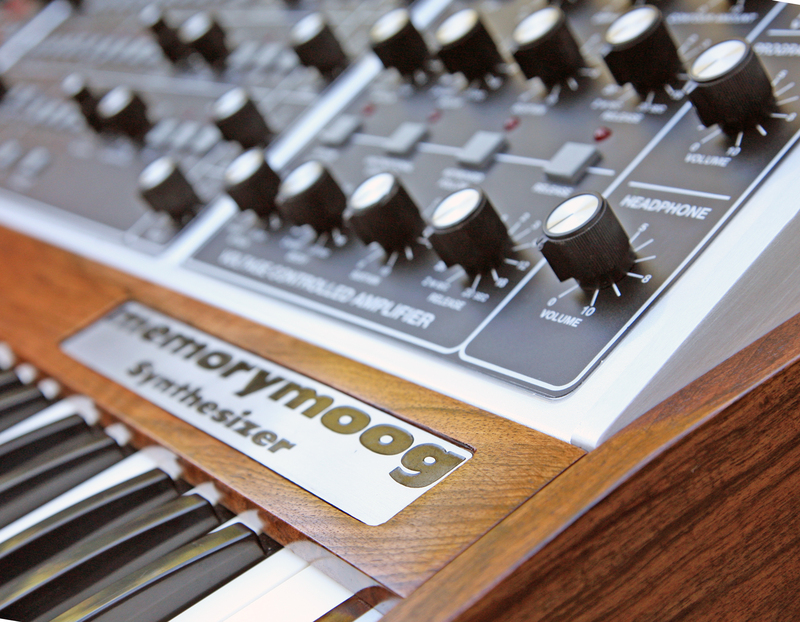 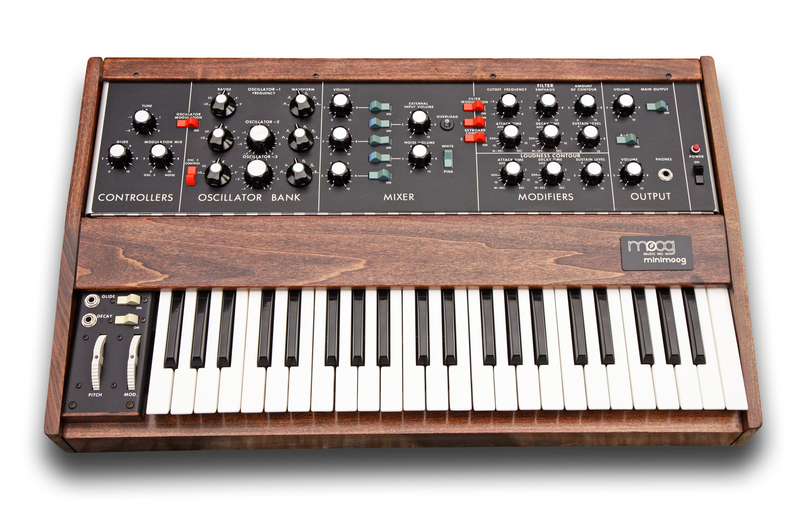 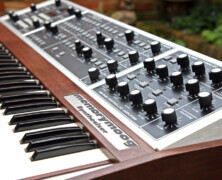 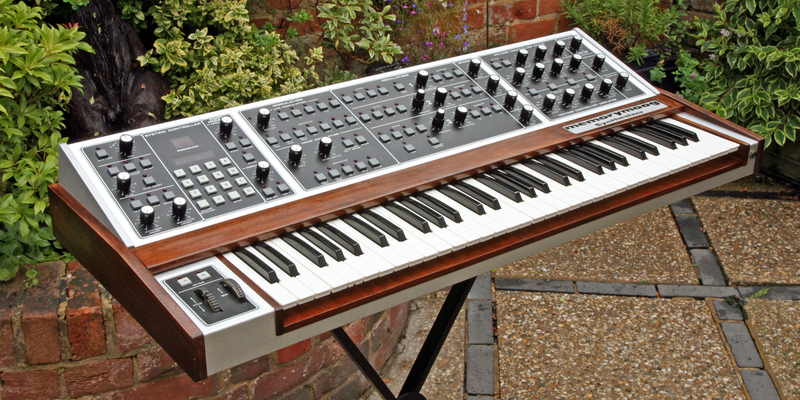 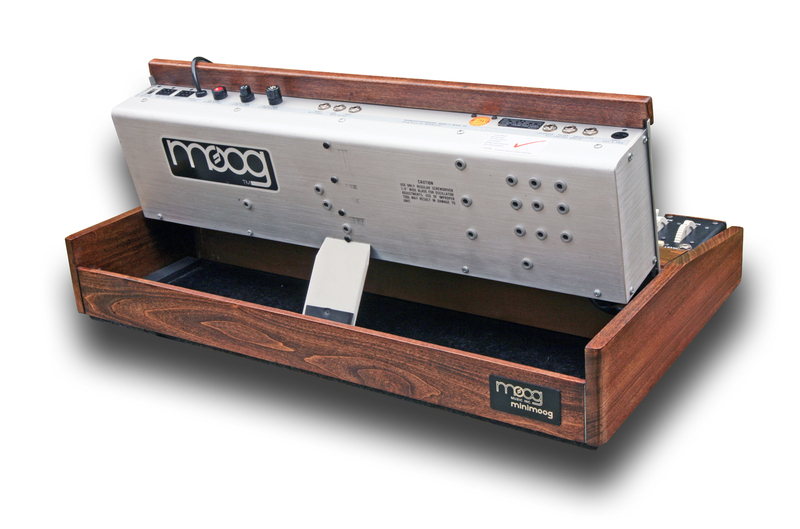 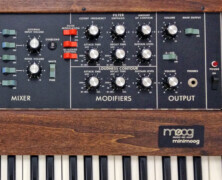 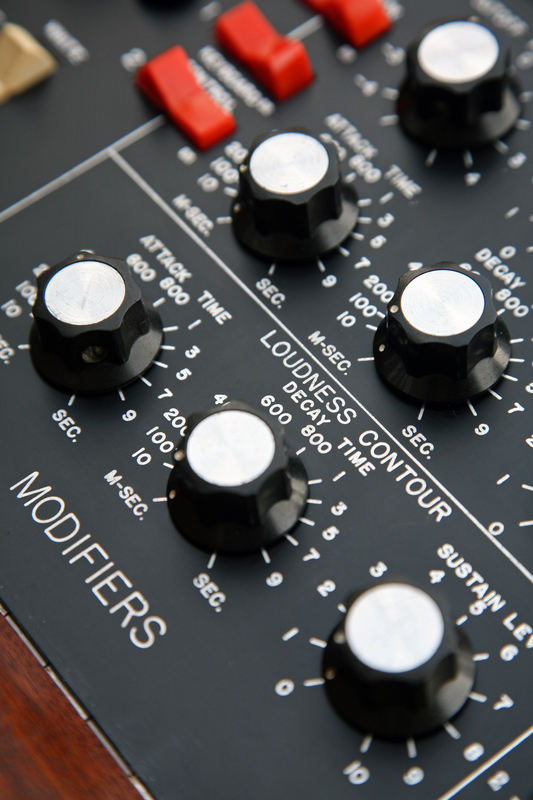 Availability: This stunning Vintage Moog is now SOLD as at 20th December 2014. 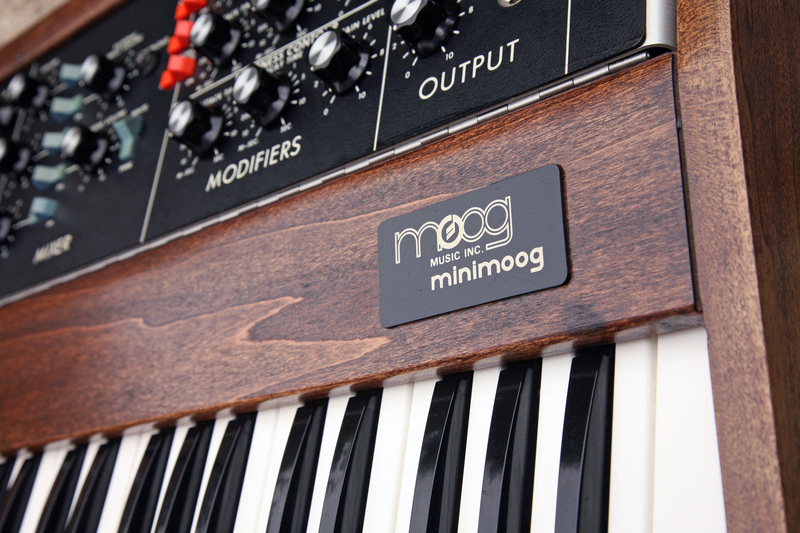 Came into stock: In stock & available now! 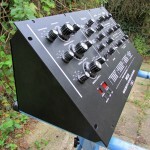 Servicing Status: Full restoration by KSR has been completed. 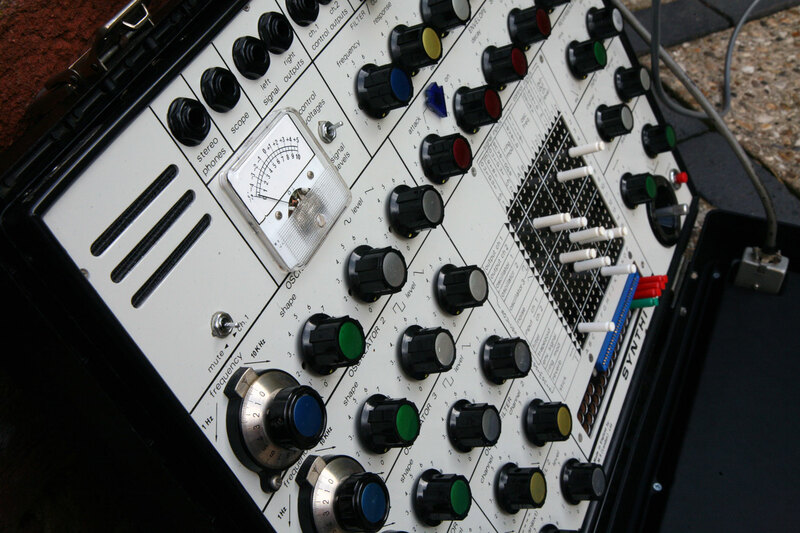 Remarks: We are delighted to offer you another rare opportunity to own a vintage (manufactured 1974) EMS VCS3 Mk2. 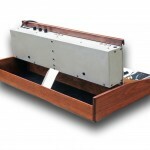 We have already undertaken and extensive professional restoration on this instrument, so this is available for sale now. 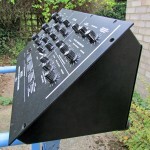 >Original wood cabinet to be stripped back to bare wood and re-finished by hand. 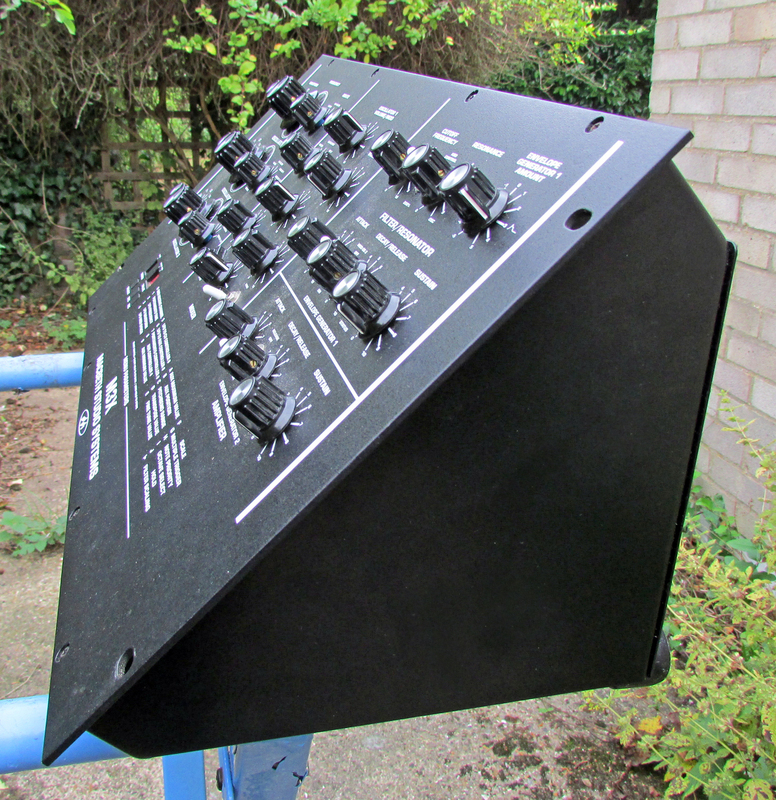 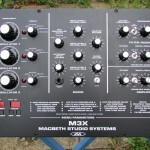 >Control Panels stripped, re-painted and re-screen printed to ‘as new’ condition. 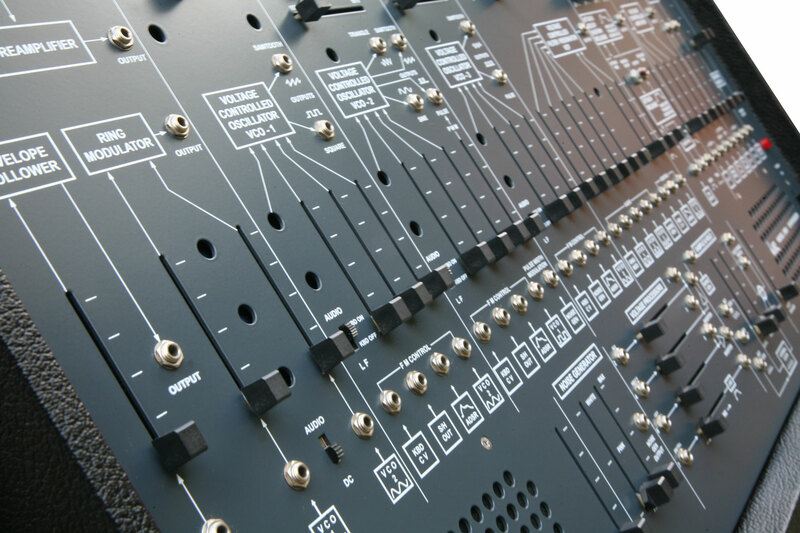 >Every control component (potentiometers/switches/matrix & pins) stripped, cleaned & lubricated..
>Power-Supply & distribution PCB have been re-capped & calibrated. 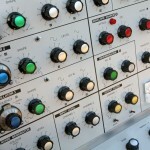 >System-wide calibration implemented in line with EMS guidelines. 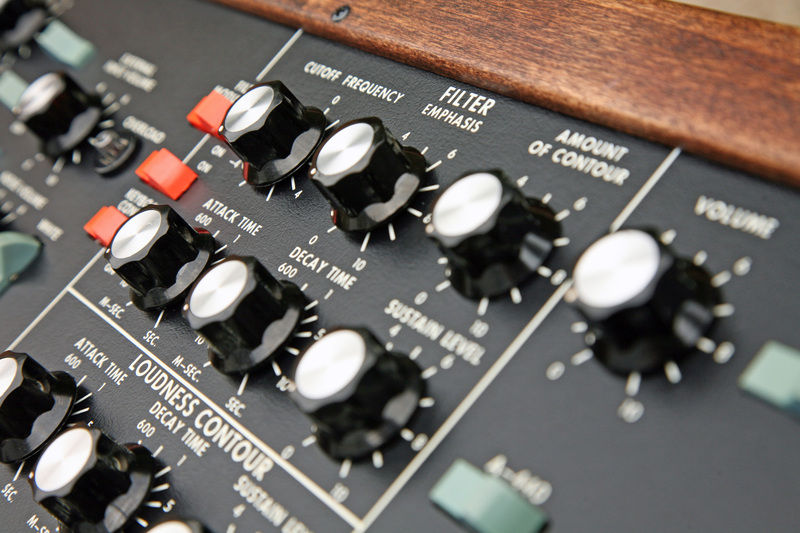 Inevitably, there were some parts that needed replacement (mostly ageing capacitors), which we worked with EMS in the supply of genuine parts, to keep the authenticity intact. 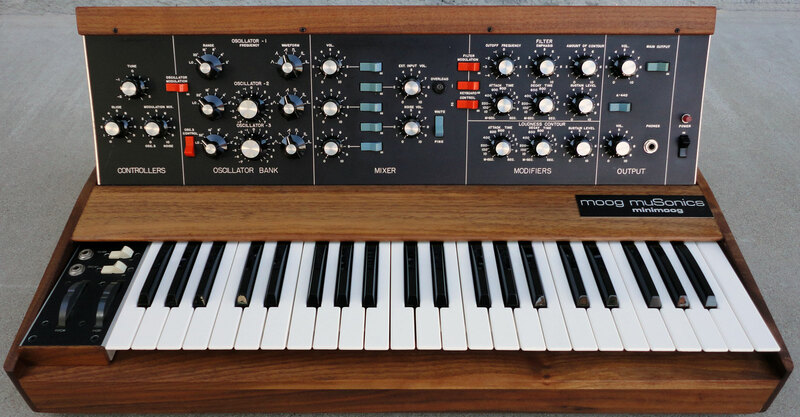 Aside the meticulous cosmetic work, the objective of the restoration it to retain as much of the original integrity of the instrument character, thus the vintage nature/sound of the synth is 100% kept intact. 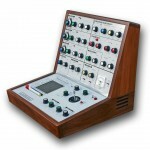 Naturally, the presentation is stunning and offers an excellent investment if you have been looking for a very special example for your own collection. 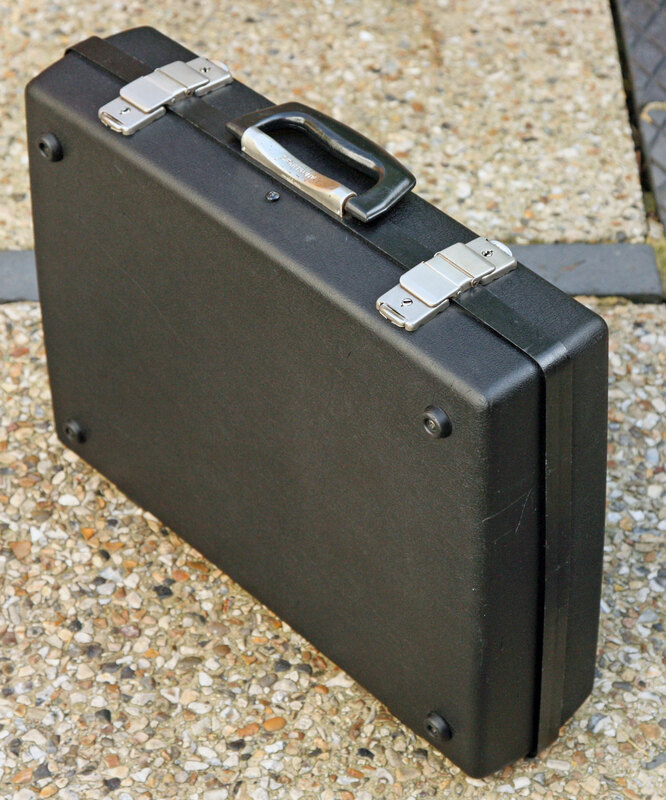 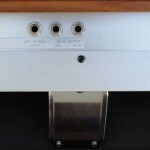 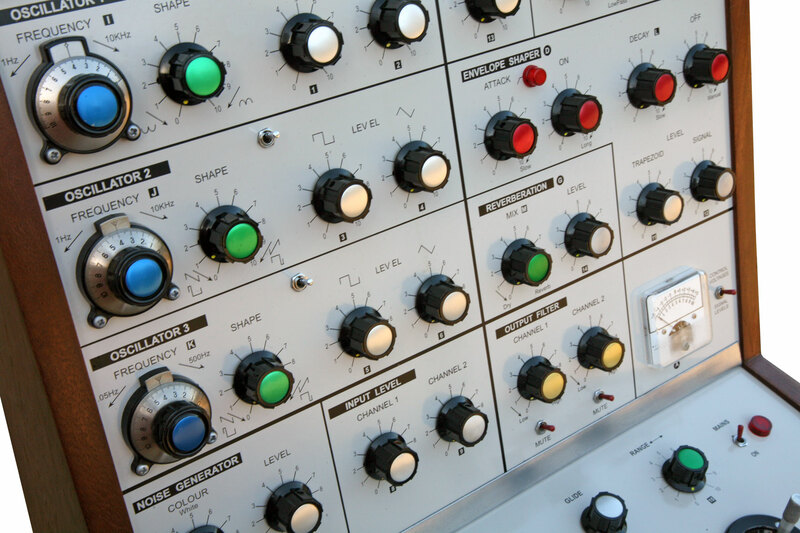 The VCS3 Mk2 is a ‘collector grade’ instrument. 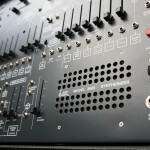 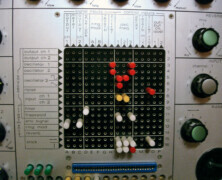 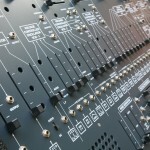 The VCS3 runs on EU 220V and is supplied with the power-cable and a full compliment of Matrix Pins. 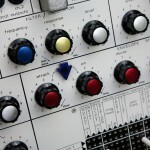 EMS VCS3 Mk2 = £9990 GBP. 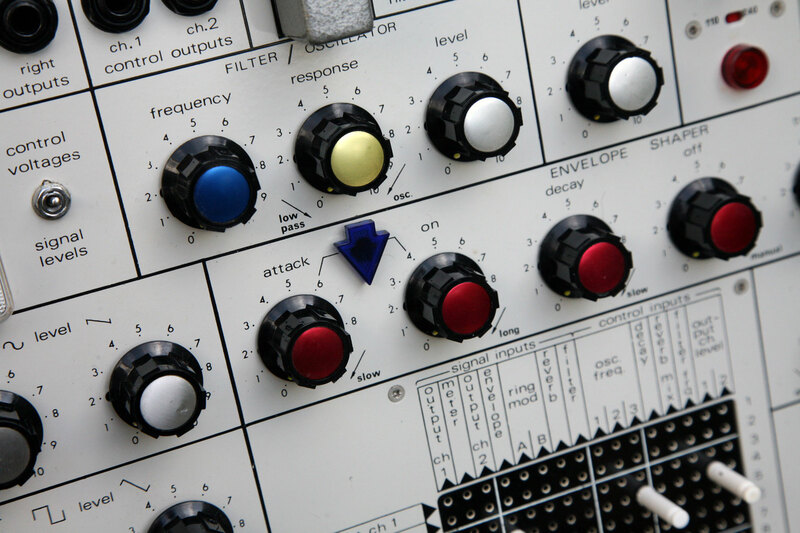 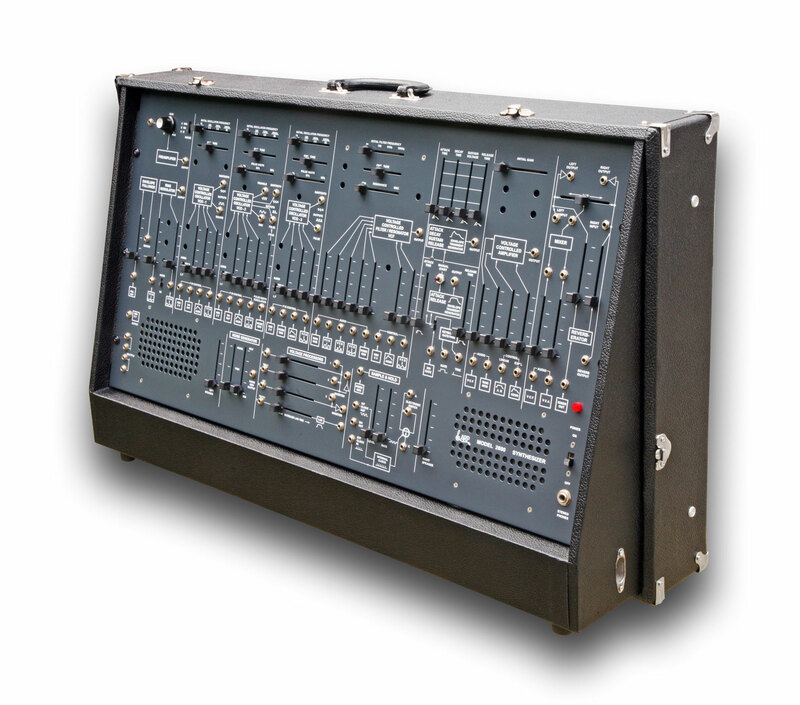 Availability: This pro-restored EMS VCS3 MK2 is now SOLD as at 2nd January 2015. 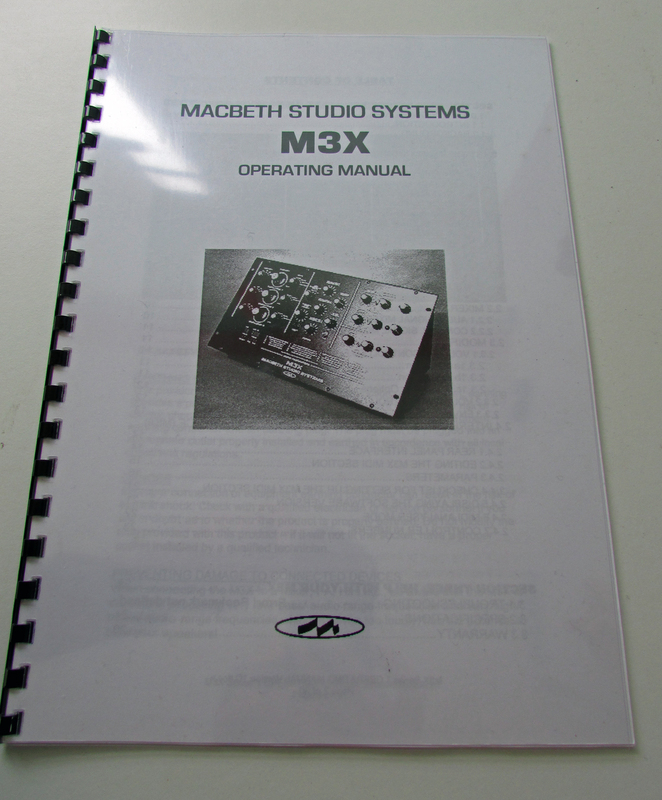 Came into stock: In stock and ready for sale. 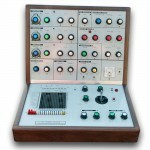 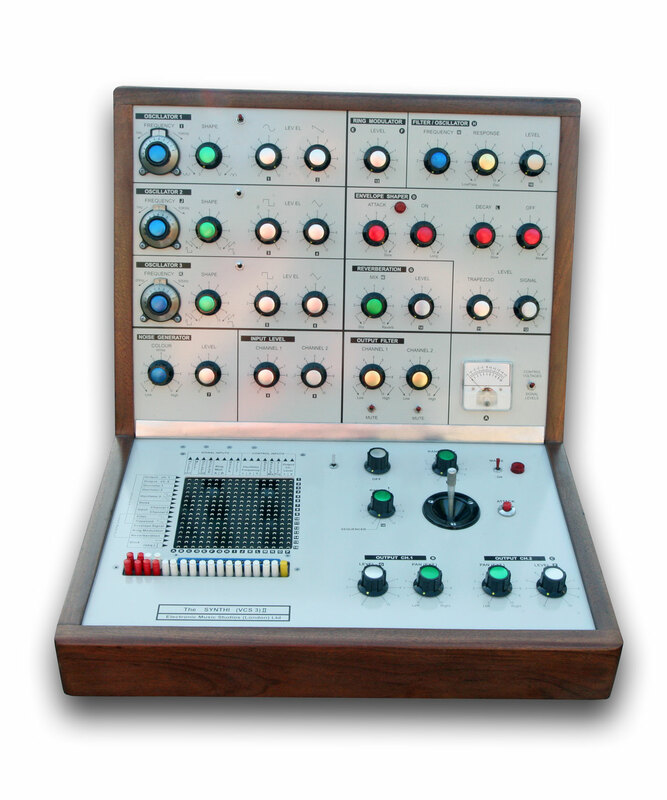 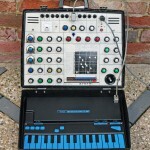 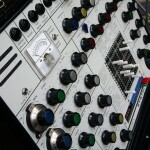 Remarks: A fabulous opportunity to own your EMS Synthi AKS, and this one is excellent all original condition. 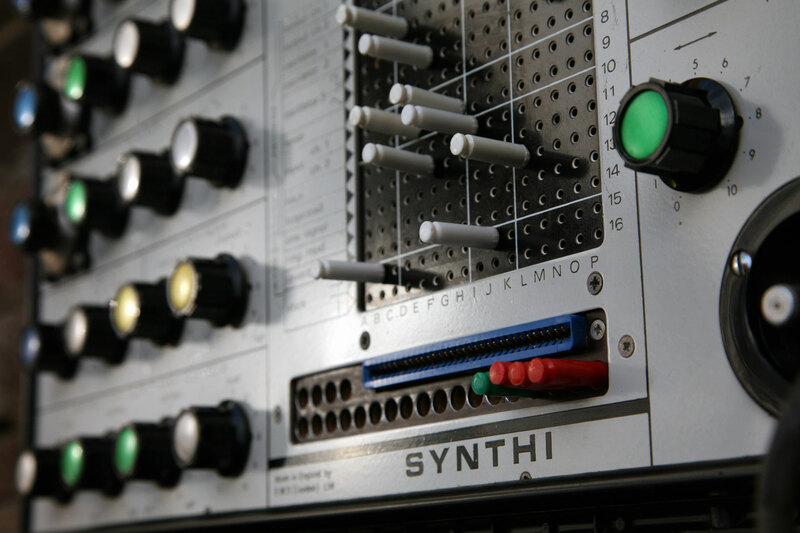 The current owner, a music industry professional, has has this Synthi AKS in his collection since 1980 (34 years) and it has been very well looked after. 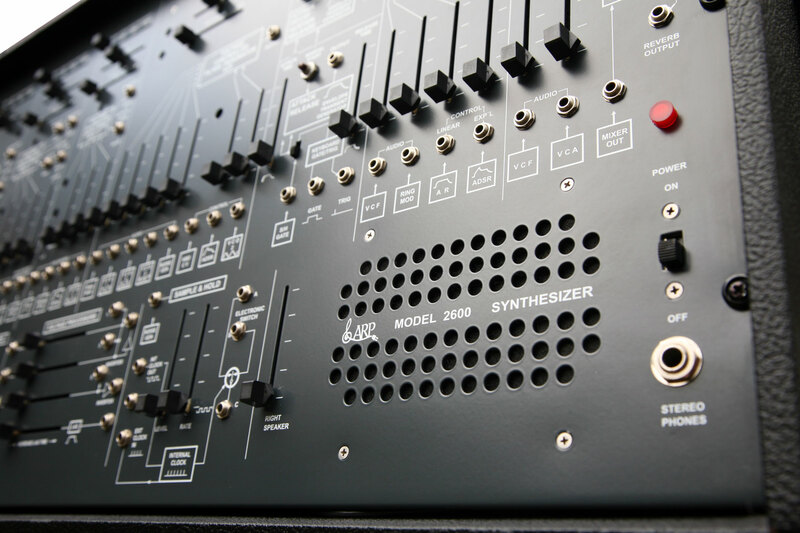 We have checked the serial number on this Synthi AKS with Robin at EMS and can confirm it was manufactured in July 1973, so an early and sought after model. 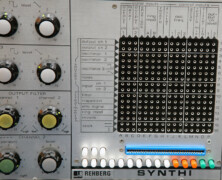 This EMS Synthi AKS has a full compliment of Matrix pins, power & KS inter-connect cable. 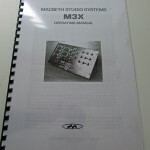 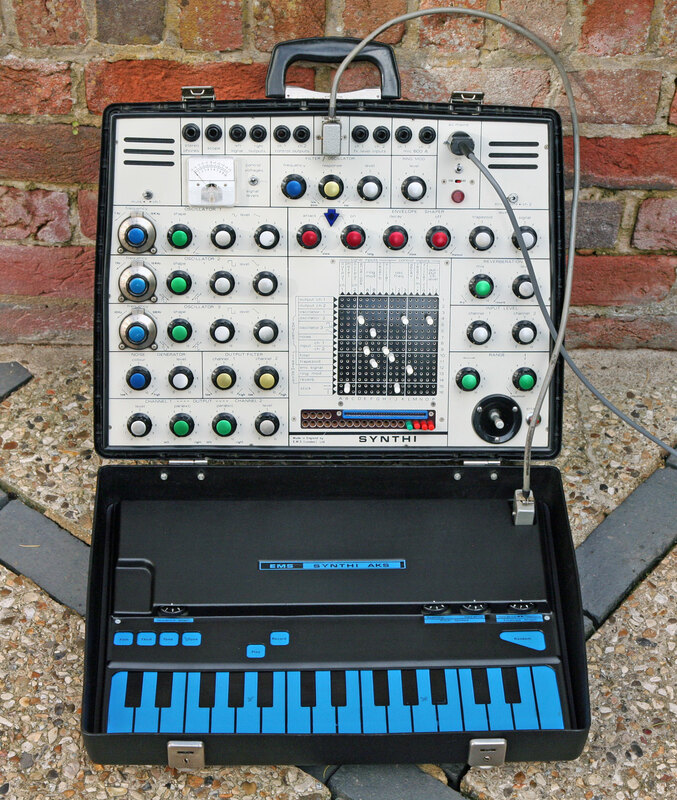 In addition, from EMS Ludwig Rehberg jr., the complete ‘SYNTHI EDUCATIONAL HANDBOOK’ (81 p.) with a foreword by Roger Bacon ’The New Atlantis’ from 1624, and (in German) a book ‘SPIEL DEN SYNTHI’ (Play the Synthi) by Ludwig Rehberg jr. published in 1980. 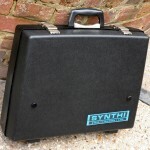 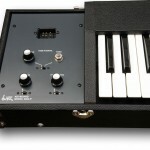 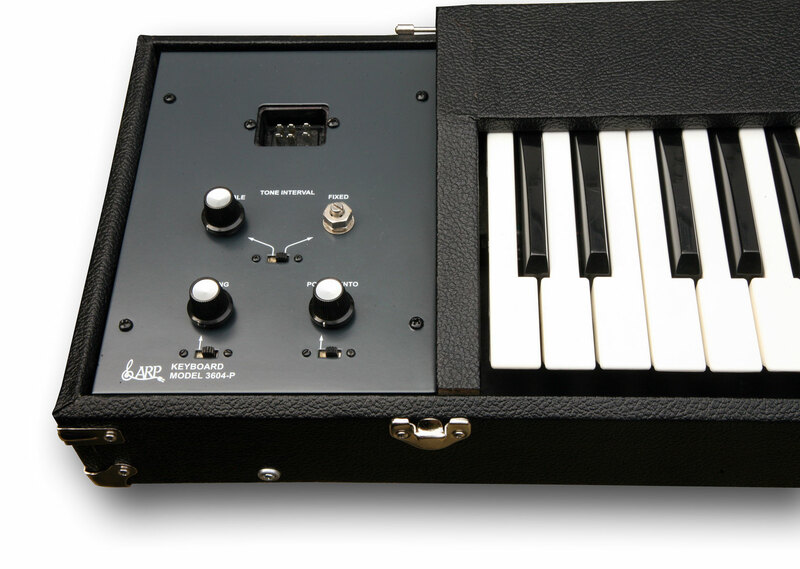 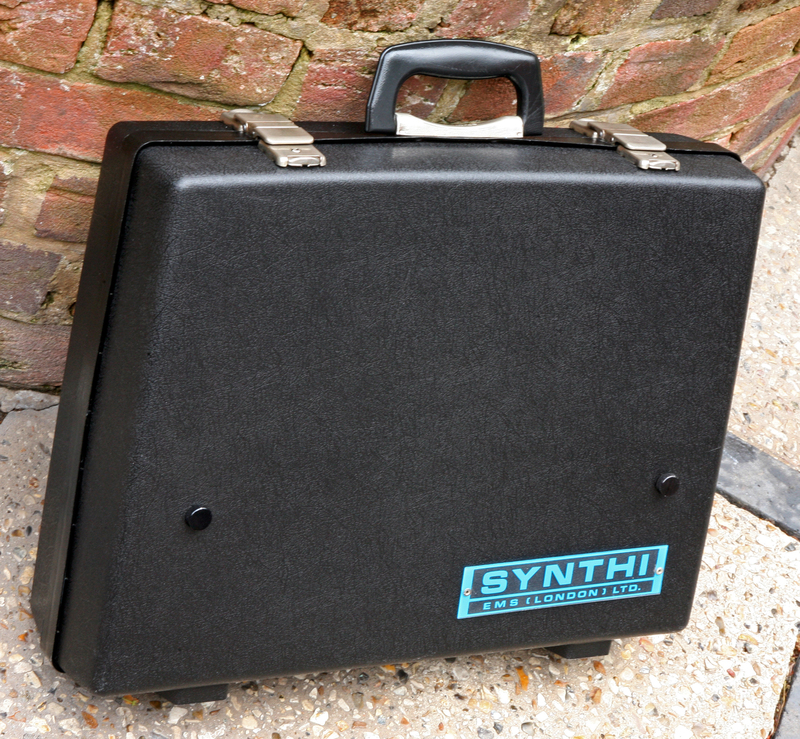 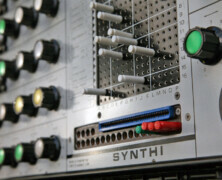 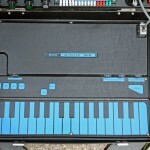 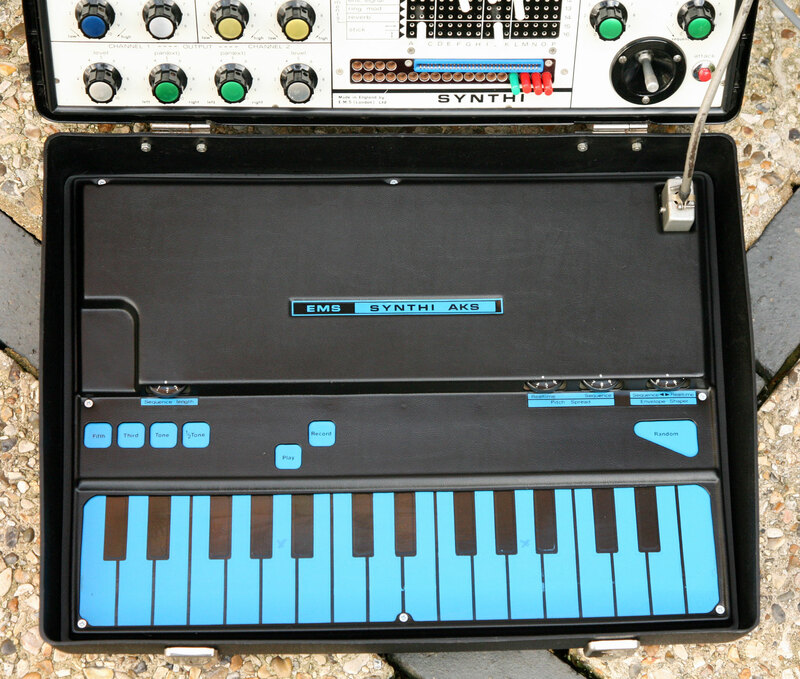 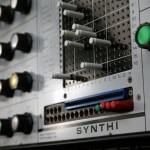 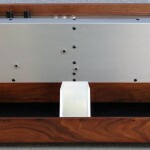 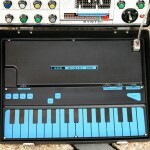 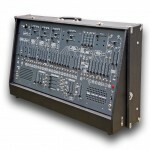 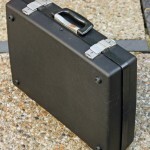 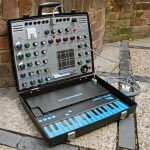 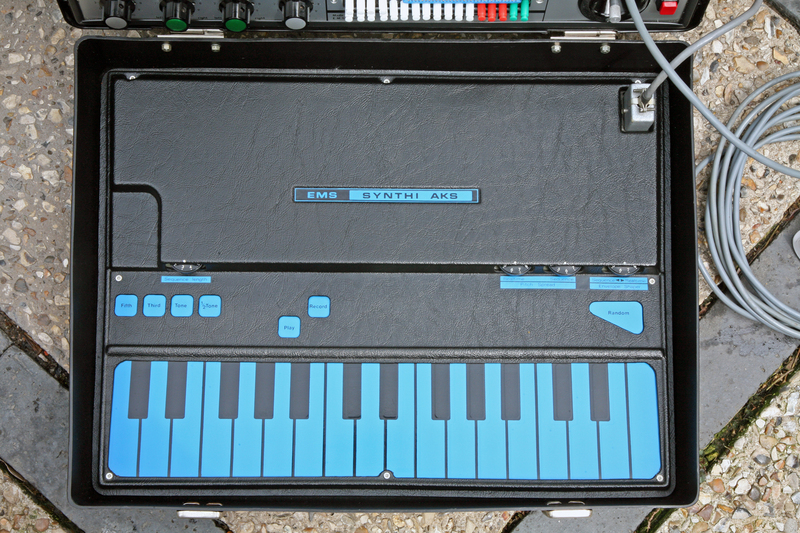 This Synthi AKS operates on EU 220V or US 110V (switchable) – it will be sold with a 3 month warranty. Unlike most of our Brokered Sales, this Synthi AKS has just ben fully pro-restred by KSR, so is ready for sale now and can be collected or shipped as soon as the sale is concluded. 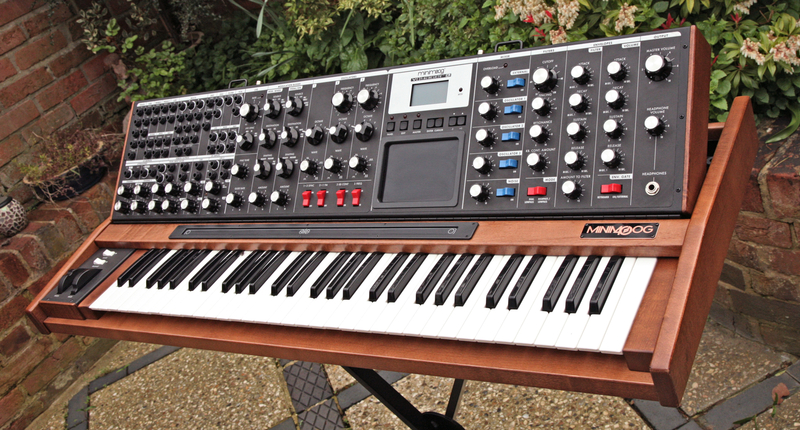 Sales Price: £10,500 UK Pounds. 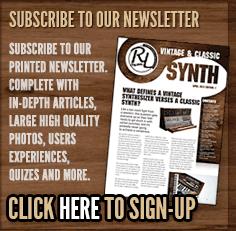 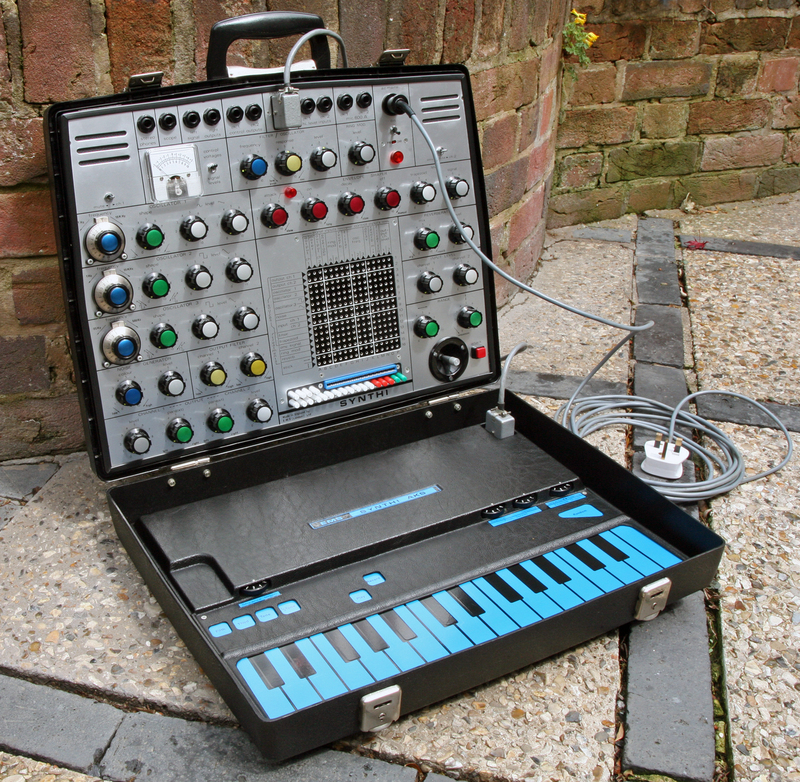 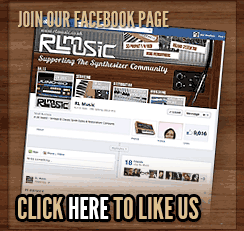 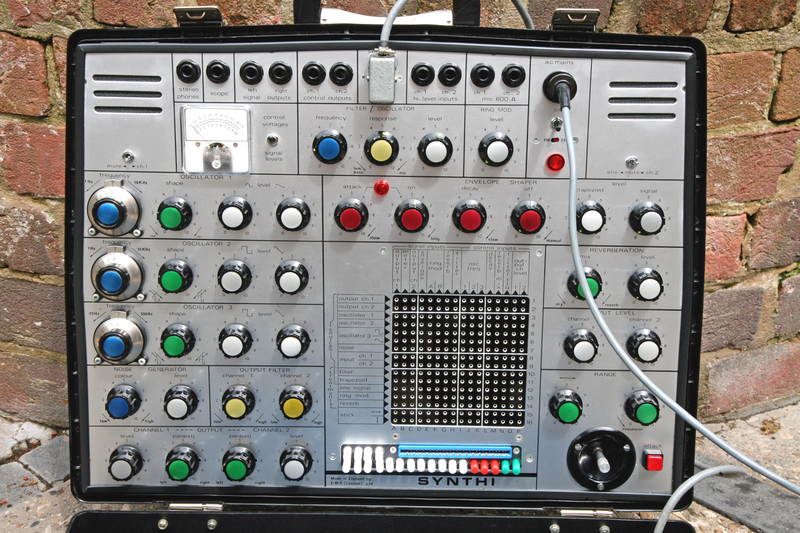 Availability: This Synthi AKS is now SOLD as at 27th November 2014. 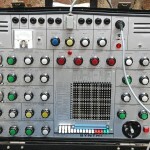 Picture below of actual Synthi AKS for sale. 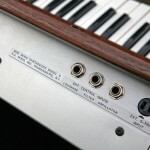 Click on the thumbnails for a high resolution photos.